Need a powerful ally? You've got one. We've called on everything we've learned from over 70 years of building the world's highest quality diesel enginess to create the most torque-fuelled D-MAX engine ever - a brand new 2.5L Two Stage Turbo diesel powerhouse rebuilt from the ground up to deliver exactly what you need, when you need it - with plenty to spare. That's 120kW/400Nm flat torque performance, lots of acceleration at highway speed and a 3.5-tonne towing capacity, all backed with ISUZU's famed reliability. The ISUZU D-MAX comes from a lineage of the world's toughest, most reliable trucks, Almost a century of truck-manufacturing DNA has gone into the all-new ISUZU D-MAX to deliver a pick-up that truly redefiness the category. A brand new truck-tough chassis means even better balance and performance whether loaded or not, delivering superior stability and road holding in all conditions. And it doesn't stop there. Under the bonnet you'll find a brand new Euro 5 clean diesel engine which offers improved fuel efficiency. Whether behind the wheel or riding as a passenger, the all-new ISUZU D-MAX will surround you with new levels of comfort. A spacious cabin provides greater head and leg room for front and rear passengers, and newly-designed wider door arches and A-pillar assist grips make access even easier. Ergonomically designed seats provide superior support and allow you to appreciate the luxury touches you wouldn't expect in a pick-up. From advanced noise control to keep the outside world at bay, to a multitude of storage compartments and cupholders within easy reach which are developed under the concept of ISUZU's "universal design", no effort has been spared to ensure every drive is a pleasurable journery. It's not just space and comfort that the interior of the all-new ISUZU D-MAX delivers. At your finger tips you will find all the technology and modern conveniences you have come to expect in a new car. Electroluminescent Instruments, climate-control air conditioner and keyless entry are all available, while steering wheel control switches give you instant and safe access to the new 6-speaker stereo system with iPod and Bluetooth connectivity. These 6 speakers includes new roof-mounted "Exciter" speakers to create a true 3D surround sound experience. At ISUZU, safety is our priority and the all-new ISUZU D-MAX reaps the benefits of this policy. There are dual font, side and curtain airbags, an energy absorbing nose section, and side impact anti-intrusion bars. A brand new cabin structure, pre-tensioning seatbelts and ISOFIX for a child seat means even more protection. You'll also have the extra assurance of Electronic Stability Control(ESC), Traction Control System(TCS) and ABS with Brake Assist(BA), not to mention daytime running lights and new LED rear combination-lamps for maximum visiblity. Drive with confidence knowing that the all-new ISUZU D-MAX is our safest car yet. Don't be decided by the sporty new looks and luxurious Interior. Like ISUZU trucks and the D-MAX beforeit, the all new ISUZU D-MAX is built to work hard for all professionals. With 3-tonne towing capacity, a larger and stronger rear tray and 4X4 electronic shift on-the-fly, there's not much it can't handle. Big loads ,sttep gradients, tough terrains, bumps and scrapes... it takes them all in its stride. 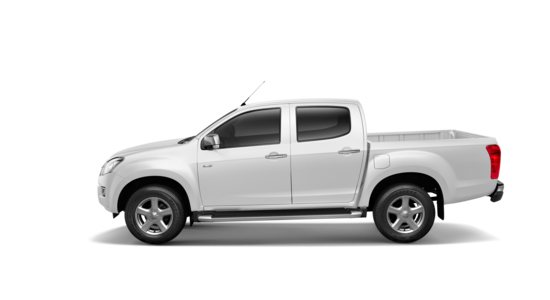 If you need a tried and tested workhorse that you can depend on, the all-new ISUZU D-MAX is the pick-up for you. It's not easy balanching environment sensitivites with a high performance work vehicle, but the ISUZU D-MAX does it easily. With class-leading aerodynamics developed from 'Bullet Train' and aeronautical technology, It's out most fuel efficient pich-up ever which achieved a class leading CO2 emission reduction, Combine that with superior engine performance, ISUZU's renowned reliablity and toughness and a sleek new look that is guaranteed to turn heads, and you have the complete package - a new era in pick-up trucks. Test drive the all-new ISUZU D-MAX today to experience the future of pick-up motorning for yourself.